Starting at 3PM Eastern Standard Time on June 12th, 2014, thousands in Brazil and millions all around the world will have their eyes glued to televisions, cell phones and web connected tablets to watch the 2014 World Cup. Contenders range from the United States to South Korea and many countries in between. While many won't be able to make it to Sao Paolo to watch the game in person that doesn't meant that they aren't showing their support in every way possible. One way that is becoming increasingly more popular is using light bulbs as a show of support. No matter who you're rooting for to make it through to the finals there's a good chance you've picked a jersey and have had more than your share of discussions why you're team will be one that who wins. Colored lights bulbs helps to take your support to the next level, especially if you have a game room, basement or other area where everyone will be grouped together to watch. They are perfect for when you have friends over and want to make sure there isn't any doubt about who you're rooting for. There are a lot of choices when it comes to colored bulbs that might fit your needs. This is going to be the most inexpensive option since incandescent light bulbs have been around for the longest amount of time. Colored incandescent bulbs are available in wide variety of sizes from the standard shaped versions you're likely already accustomed to all the way to smaller S14, S11, C7 and C9 bulbs. For extra effect, you may to also consider colored spot or flood lights. Compared to colored incandescent bulbs, colored CFL bulbs will be more expensive however, they provide a longer bulb life. With many CFL lights there is a period of time that the bulb needs in order to warm up. If decide to use CFLs and start second guessing your decision when you first turn them on it may be best to give them 60 seconds to reach their full brightness and then assess the lighting it provides. If you've already converted the rest of your home to use LED light bulbs or generally prefer to use the latest in lighting technology, colored LED bulbs are also available. 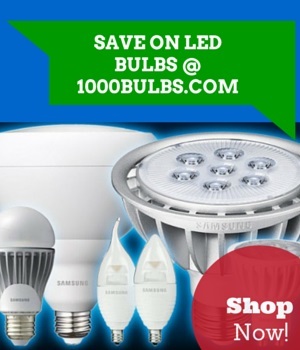 Colored LED light bulbs offer the longest lamp life compared to incandescent or CFL but do so at an additional cost. LED bulbs use less power and also produce less heat which is a great added bonus if you're already in a part of America that is already experiencing warm weather. Rope lights provide an amazing amount of flexibility not just because of their form factor but also because of their length. You're able to cut the rope light to the length you need and use the rest in another room or section of the space. Also, you can use a specific amount without having to worry about how you'll have to hide the rest. Make sure to pick up whatever accessories you need in order to use the other sections if you don't intend to use it all at once for the same application. Rope lights are available in several colors in both incandescent and LED variations. Regardless if you're rooting for Germany, Brazil, France or the United States you can find the colored bulbs you need at 1000Bulbs.com.